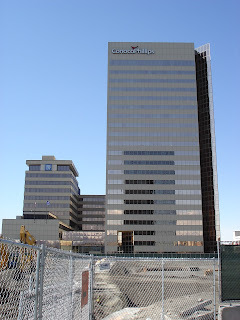 Standing 296 feet tall with 22 stories, the ConocoPhillips Building in Anchorage Alaska is the tallest in the state. The modernist steel high-rise was designed by architectural firm Wirum & Cash, and constructed in 1983. The main tower, located at 700 G Street, serves as the regional headquarters for ConocoPhillips. Its atrium features a food court and a decorative fountain and is open to the public. The smaller tower provides office space for the local branches KMPG, New York Life and other companies.